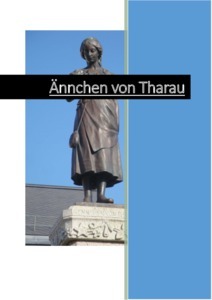 Original title in German: "Ännchen von Tharau"
You and I, we shall stand together. Shall ever be able to part us again. And my life with yours I gladly entwine. The more rain and hail it has to suffer. Weathering the cross, suffering and need. Had to live where there is no sun. Through ice and iron and armies of enemies. What I ask, you lovingly do. What I forbid, you respect that, too. Where lovers do not speak with one mouth and one heart? And behave like cats and dogs in the dirt. Annie of Tharau, that’s not for us, my love. You are my lamb, my chick, my dove. All my desires you guard with your life. I shall be your husband and you my wife. When wed, we’ll be one body, one soul. And not, as in anger, a fiery abyss. Anna Neander, daughter of the village pastor, Andreas Martin Neander, in Tharau (Vladimorovo), was born there in 1619 and baptised in the village church. Tharau lies some 4 km to the west of the main Königsberg to Preussisch-Eylau road on a level with Wittenberg (Nivenskoe). Anna Neander lived for 36 years in Laukischken (Strankoe) and was the wife of 3 pastors of that parish, Portatius, Grube and Beilstein. She outlived all three of her husbands. She then moved to Insterburg to live with her son. She died there and was buried in the local cemetery. A memorial stone in a Park in Insterburg reminds us of her to this day. The song comprises 17 verses and was originally written in a Low German dialect. The author is believed to have been a certain Simon Dach, poet and then professor of poetry at the University of Königsberg. He was born in Memel on July 27th, 1605 as the son of a court translator. He died on April 14th, 1659 in Königsberg. It is said that Simon Dach met Annie on a ferry. Her beauty inspired him to write the poem for Anne’s wedding with Pastor Portatius. The poem was later translated into High German by the East Prussian Johann Gottfried Herder and set to music by Heinrich Albert, composer and organist of the Königsberg Cathedral. He was a friend of Simon Dach.